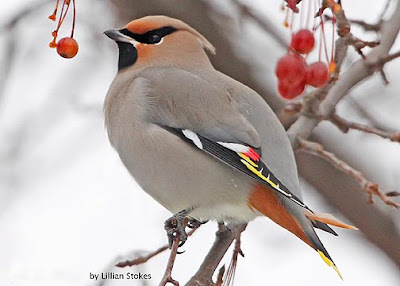 STOKES BIRDING BLOG: Bohemian Waxwings, Awesome Birds! 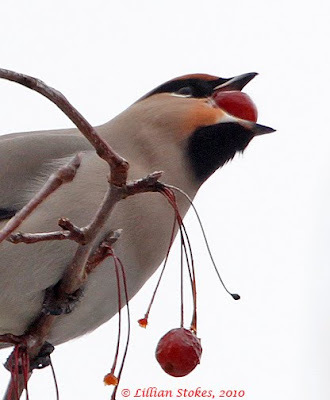 Bohemian Waxwings are being seen this winter in NH. Sometimes, the stars are aligned for a photographer. 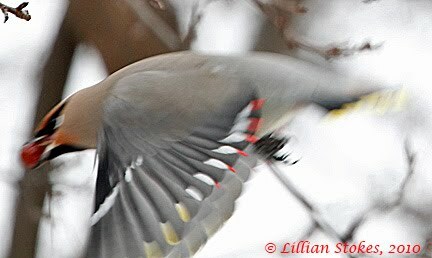 I went to northern NH several years ago to try and photograph Bohemian Waxwings. Where hundreds had been reported, I found only one, but what a cooperative bird! Click, click, click. 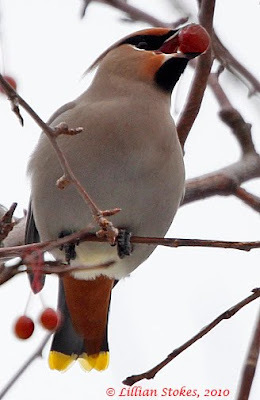 It posed, feeding on the crabapples, resting to digest them, looking about, even eating snow at one point, all the while oblivious to me and the other passers-by in the parking lot where it was. If you want plumage drama, then this is the bird for you. 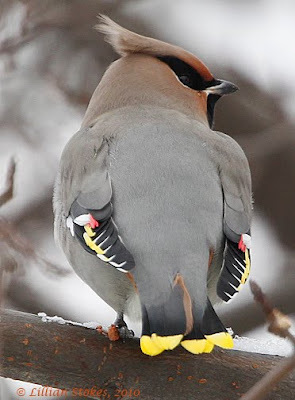 What an exquisite contrast between the gray-brown, velvety, body feathers and the dramatic black, white and orange facial, wing and under tail markings, all finished with the yellow tail tip like an exclamation point! These graphic markings remind me of certain styles of japanese painting or designs on Native American pottery. A huge advantage of digital photography is that you can enlarge and look closely at your photos and discover fascinating things about a bird, such as that the black mask is underlined with white. 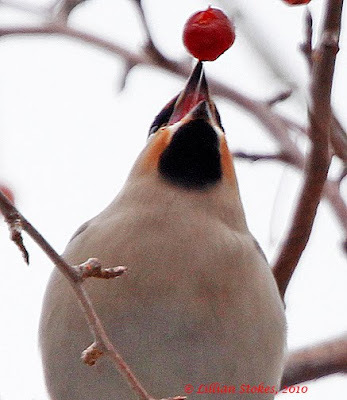 You can notice what a small bill yet large gape this bird has. The black comes fairly far out the upper and under surface of the bill. Waxwings (both Bohemian and Cedar) have appendages on the wing, like little, red candles. 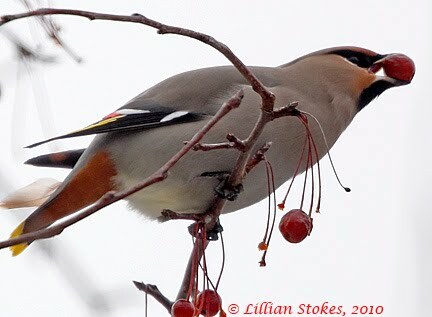 This bird was agile in grasping onto the crabapples, then let go. 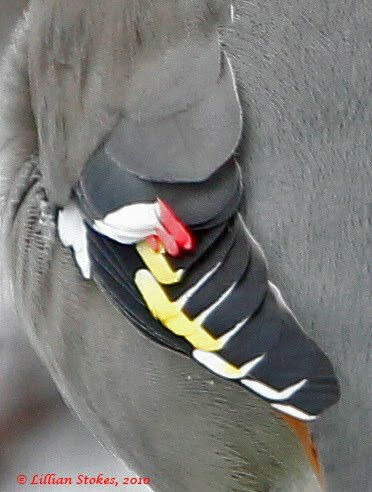 My camera caught this spread wing which shows at least 6 waxy projections which are the tips of the secondary feathers. How cool is that! It's all about crabapples and eating them. 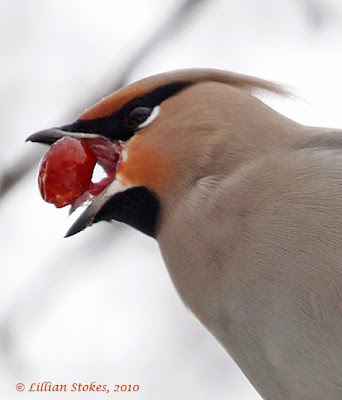 Waxwings are big fruit eaters and usually wander in flocks, all the more eyes to find the berries. It's interesting this bird was alone. 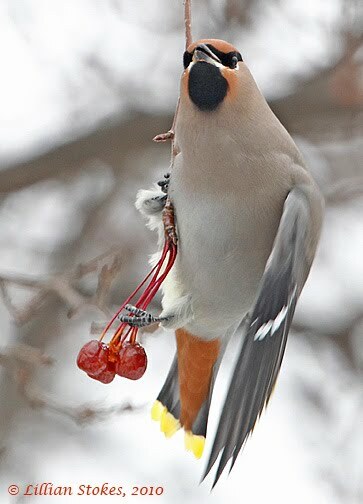 Many of the crabappple trees at this location were pretty stripped of berries, perhaps the flock had moved on. It's just amazing how wide that bill can open, reminds me of a snake swallowing prey. We also saw this bird eat snow, getting fluid to help process the fruits. 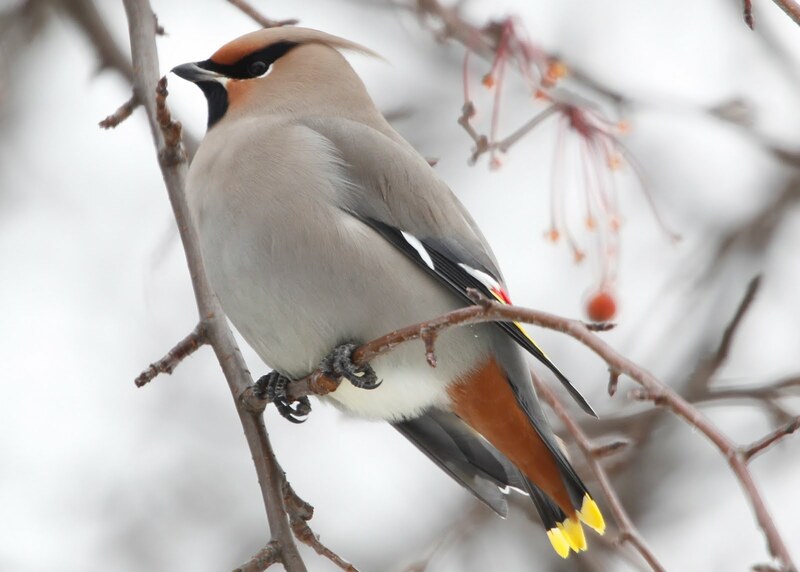 Bohemians are far northern birds, nesting in the boreal forests of mainly western North America (as well as the northern parts of Europe and Asia). 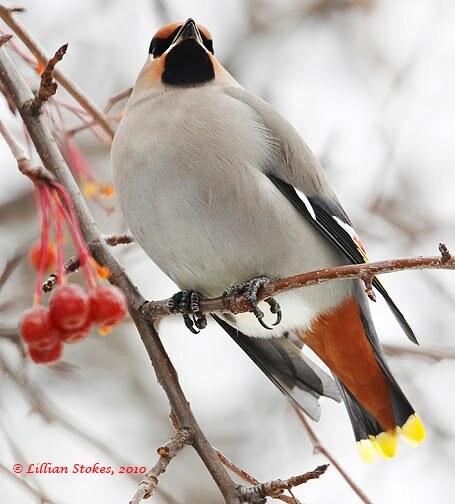 When their prime food of berries is in short supply in winter they" irrupt" or wander widely (hence the name bohemian, i.e. gypsy-like) down into the northern areas of the U.S. I was in heaven photographing this beautiful Bohemian Waxwing. Photography is not a zen moment as some people may think. It's fast, furious, demanding of all my skills and a rush when I think I am getting good photos. 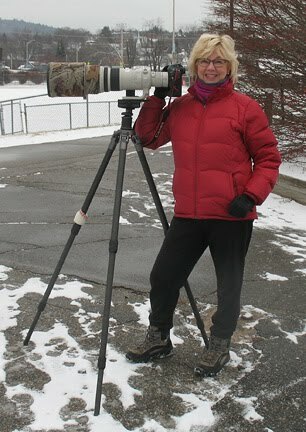 You never know if your subject bird will fly away so you have to keep clicking, moving your angle and big camera, as the bird moves in the tree, adjusting f-stop, ISO, exposure compensation, etc. 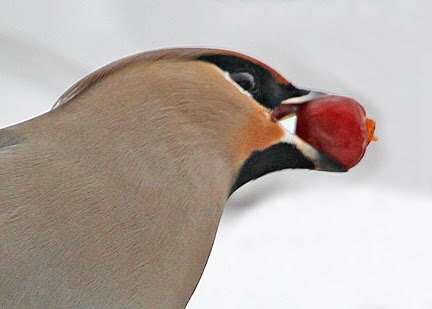 You're grateful if you come away with half decent photos or thrilled, as in this case, when you get fascinating images of an extraordinary bird. I love it!